Every year, the admins go through the same approval process in the Roost Common Room. When a student registers correctly, she’s approved; fail to follow instructions, and the registration gets thrown into the evil claws of the frumious bandersnatch. Yet in 2000-early, a few oddly registered characters began to appear in various parts of the Roost. They were approved by Professor Laffengraff (then Head of House of Ravenclaw), so clearly these accounts existed. Still, who’d ever approve of the HOL name of Tess Tosterone? 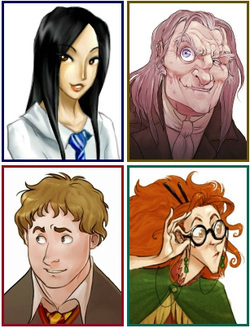 Within weeks, the Roost was invaded by the likes of Cho Chang, Alastor Moody, Remus Lupin, Neville Longbottom, Sibyll P. Trelawney, and Tess Tosterone, among others. A forum area was even created solely for the purpose of housing these super-secret “experts,” which became known as Ickle Eagles Ask the Experts. In the beginning, the forum itself was all for good fun; half a RPG and half mischief created by the prefects and professors of the time. If somebody had a question about being ill, more than likely Remus Lupin would suggest a potion, while Sibyll P. Trelawney would suggest avoiding the Roost, for fear of an epidemic spreading through the veins of the Internet. By the end of their rather successful year, the experts even gave out awards (some like Alastor Moody accused certain students of being likely thrown in Azkaban...). At the rate they were heading, it looked like the Experts were to stay. Unfortunately, the time of the original Experts have come to pass, especially with the disappearances of the prefects and professors who played them (or maybe they were also fed to the frumious bandersnatch for insurrection...). And today, the Ickle Eagles Ask the Experts forum has become a place for questions, akin to the Ask-a-Prefect forum in HOL. There, you’ll be able to read the Ravenclaw FAQs and ask questions that you might not be willing to post in the HOL Forum.